What Equipment Is Required For Fall Protection or Fall Arrest? 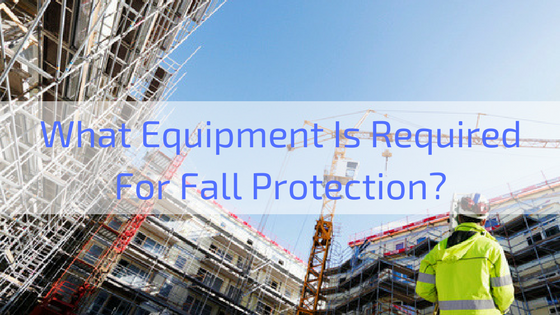 What Equipment Is Required For Fall Protection? Workplace dangers for certain professions are major concerns that cause serious injury and, in some cases, death from falls. Avoiding either of those two scenarios takes attention to detail by both the workers and their supervisors and the use of fall protection equipment that will attack the problem before it even has a chance to surface. Besides the basic concern for worker safety, fall protection is needed by a company in order to avoid problems with OSHA that can result in steep fines. Financial penalties like that can turn a positive bottom line into one that’s bleeding red ink. That equipment varies depending on job circumstances, with different height requirements determining usage. Any jobs that take place four feet above the ground or higher need the equipment, with incremental steps for three specific industries. For those working in shipyards must be protected when five feet or higher; construction workers at six feet or higher and those in the longshoreman industry at eight feet or higher. All employers that have workers walking on elevated platforms need to make sure that guard rails are in place. In addition, reaching such areas in the first place will require steps that should also have guard rails in place in order to negate the possibility of a fall. Any work being done over machinery or equipment that’s deemed dangerous requires fall protection period. For work that’s being conducted on a rooftop, the possibility exists of skylights becoming a potential safety hazard. This is another area where guard rails can provide a valuable service and stay within OSHA directives. The versatility of lifelines is such that they can be used for individuals on a roof or those working on the side of a building to tether a worker and avoid falls. Within this particular piece of equipment, some companies choose to rely on a cable-based system and others prefer one that’s rail-based. The most advanced versions allow for freedom of movement in such areas by multiple workers and are designed to withstand the many changes in weather that occur during the course of the year. To avoid any potential confusion that may not specifically indicated the need for this equipment, lifelines can also serve the same purpose that harnesses do for workers. For those lifelines to work, they have to be anchored to the structure. The anchors are put in place and take advantage of the overall strength of the building, which offers anyone using the lifeline to have reassurance that their safety has been taken into consideration. Those installing such anchors on top of the building have to be adept enough not to damage the roof during the process. In less dangerous circumstances, a business can also choose to go with a single anchor, while those looking for a more subtle approach to such use can go with a custom anchor. Both of these approach this concern more from the prism of aesthetics, since the activity will be much more visible than many rooftop concerns. This may be the most obvious piece of equipment, considering the clear danger than can result from someone falling in a large enough hole in the floor. It’s especially important when that floor happens to located on the roof, since that’s a drop that could serious injure, if not kill, an unsuspecting worker. Using a roof walk can at the very least make the situation safer, allowing for no real disruption of work. Of course, using this walk in more precarious areas also makes sense, since it avoids the prospect of slipping. All of this equipment needs to be available at no costs to workers and the potential hazards explained in a language an employee understands. Tritech Fall Protection Systems has these items available and can speak with you about any aspect of fall protection equipment you might need, so contact us today! Fall Protection Anchors: What Are They and How do You Use Them? How Does a Safety Harness Work?